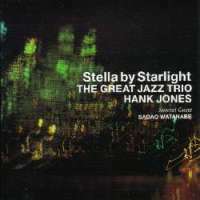 Description: Although Sadao Watanabe was a guest on this album, I like to see it as a long-awaited, important reunion between the Japanese alto saxophonist and Hank Jones. In 1976, Watanabe went to New York and recorded a wonderful, straight-ahead jazz album called I'm Old Fashioned with the newly formed Great Jazz Trio which included Jones, Ron Carter and Tony Williams. This was a very special, 30-year reunion. Hank Jones, who was 88 years old at the time of the recording, has led many iterations of the Great Jazz Trio. The current band includes John Patitucci on bass and Omar Hakim on drums. This strong trio juxtaposes the agelessly elegant style and sophisticated harmony of Jones with the sharp, ultra-modern drumming of Hakim for interesting effects. The bass master Patituccion provides the solid foundation and imaginative solos. The trio itself is worth the price of admission, but as I wrote earlier, Watanabe's presence makes this album even more special. On "Stella by Starlight," he displays his total trust and comfort in the backing of an old friend. He and Jones have a ball revisiting the title tune from the 30-year-old album. Another highlight is Watanabe's lyrical and heartfelt ballad playing in "Old Folks" and "Deep in a Dream." The pure DSD recording at the Sony Studios in Tokyo, by Sony's chief engineer, captured all this in a glorious, natural sound. The SACD layer is wonderful, but the "redbook" CD layer sounds pretty good, too! Highly recommended for both jazz lovers and audiophiles! Produced by Yasohachi "88" Itoh. Recorded at Sony Music Studios Tokyo on September 4, 2006, by Yoshihiro Suzuki. Pure DSD recording. This Hybrid SACD plays on both SACD players and regular CD players. Japanese paper sleeve edition.